Our high visibility steel heads conform to ANSI, BS876 & ISO 15601 specifications and the faces are induction hardened to 50-58 HRC with a superior grain structure for extended life. The abrasive-resistant rubber is injected all the way into the eye of the hammer. The rubber in the eye inhibits the transfer of shock into the handle, reducing fatigue and the risk of injury. Further protects from countless overstrikes. Safely secures the hammer to wrist or stationery object. The innovative locking plate design and unique bonding process ensures that our heads will never separate from the handle. The handle is shaped to provide a comfortable and secure grip in both wet and dry conditions. 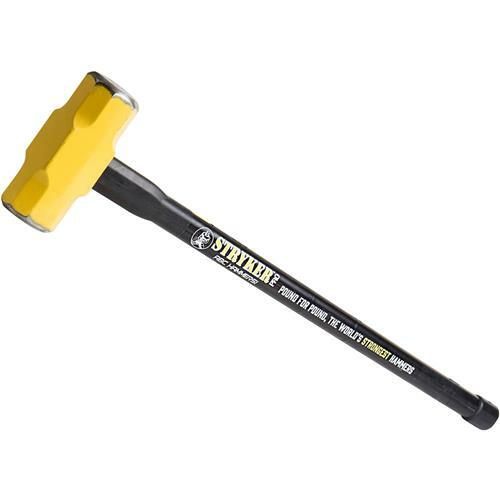 The handle consists of high tensile spring steel rods, which are molded in a very strong and abrasive-resistant rubber making it unbreakable with superior durability. Making it the ultimate in safety and reliability.